LOS ANGELES — The Clippers had no interest in dissecting their offensive performance Saturday night. What they focused on was their defense. Their 108-76 victory over the New Orleans Pelicans at Staples Center was a splendid example of how good they can be when they play together, and how aggressive defense can often result in productive offense. "As good as our offense has been, I know if we can defend — and the better we defend with the offense we have — it makes us really good," coach Doc Rivers said. "That’s the message I think our guys are starting to get. If you can set the tone early in the game defensively, then you can be really good." 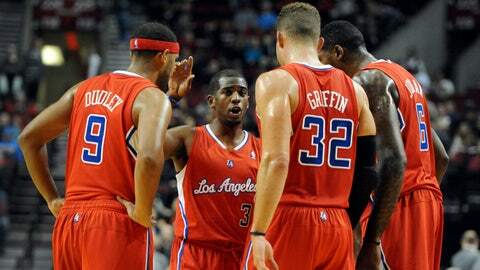 Right now, even through their current adversity, the Clippers are darn good. Guards Jamal Crawford (strained left calf) and J.J. Redick (bulging disk in his lower back) are out, and newly signed Danny Granger sat out because of a snafu in the starting lineup, but it didn’t slow them down. They won their fourth game in a row and seventh in nine games, holding the Pelicans to just 32.9-percent shooting. New Orleans was 3 of 22 from three-point distance, and young star Anthony Davis, averaging 20.5 points coming in, was 1 of 6 shooting for eight points. "Tonight was about our defense," guard Chris Paul, who scored 21 points, said. "With our team, it’s not about me, it’s not about Blake (Griffin) or D.J. (DeAndre Jordan). It’s about our team." 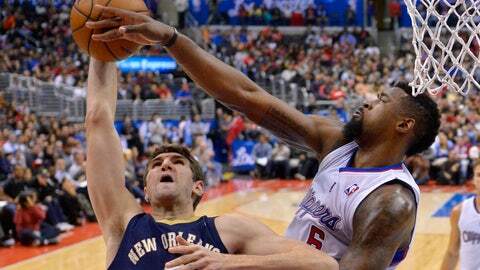 The Clippers forced 20 turnovers, blocked nine shots and finished with nine steals. They also outscored the Pelicans in fast-break points 25-2. "There were times tonight when guys were flying around," Griffin said. "Even when we were up 10, 15 points, we stayed consistent on defense." Griffin has been a picture of consistency himself. He scored 20 points for a 19th consecutive game, tying Dominique Wilkins (1993-1994) for the L.A. Clippers franchise record. With Crawford sidelined, Paul took on more of a scoring burden, making 7 of 11 shots and adding eight assists. "One of our assistant coaches, J.P. Clark, talked to me before the game about being more aggressive, looking for my shot," Paul said. "I tried to do that, especially with Jamal out." Rivers said, "Chris knows Jamal is not there and we have to create offense from someone else, and you could tell C.P. thought that would be him. We told him that — ‘You can’t just go out and orchestrate the team tonight. We need you to be a scorer because there’s no Jamal or J.J.’ "